From 1990 to ’92, the Kansas City Chiefs had made it to the postseason, only to win one playoff game over the course of the three years. For the 1993 season, Head Coach Marty Schottenheimer’s team had obtained QB Joe Montana (pictured at right) in a trade from the 49ers – the 37-year-old all-time great was injury-prone and past his prime, but still a masterful performer. Another veteran addition, RB Marcus Allen, also paid dividends. Both Montana and Allen had Pro Bowl seasons. So did DE Neil Smith, who led the NFL with 15 sacks, and LB Derrick Thomas. The team went 11-5 in 1993 to win the AFC West. 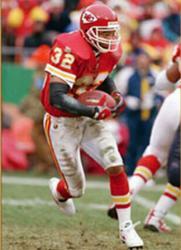 The Chiefs hosted the Pittsburgh Steelers in the Wild Card playoff game on January 8, 1994 at Arrowhead Stadium. Pittsburgh had been in the postseason in the first two years under Head Coach Bill Cowher, but had struggled at times in ’93, going 9-7 to finish second in the AFC Central and claim a wild card spot. RB Barry Foster, who had run for 1690 yards in ’92, went down with an injury that cost him half the season and hindered the offense. With QB Neil O’Donnell, they ran a ball-control offense and leaned on an outstanding defense that included LB Greg Lloyd and CB Rod Woodson. There were 74,515 in attendance on a cold day with temperatures in the teens. The Steelers struck first, following a Kansas City punt on the game’s opening possession. Pittsburgh drove 66 yards in nine plays, highlighted by an O’Donnell pass to RB Merrill Hoge that covered 32 yards. O’Donnell connected with TE Adrian Cooper for a 10-yard touchdown and early 7-0 lead. 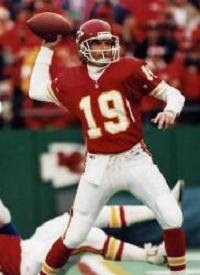 Later in the period, after the teams traded punts, the Chiefs put together a seven-play, 75-yard drive in which Montana was briefly knocked out of the game with a rib injury. Veteran backup QB Dave Krieg threw just one pass, but it was complete to WR J.J. Birden for a 23-yard touchdown. The score was 7-7 after one quarter. Pittsburgh responded with a long, 15-play drive that led to a 30-yard field goal by Gary Anderson. Following a Kansas City punt, the Steelers advanced to the Chiefs’ 35 at the two-minute warning, but O’Donnell threw an incompletion on a fourth-and-seven play. Montana completed three passes and Kansas City made it to the Pittsburgh 42, but on fourth-and-one DE Gerald Williams sacked the veteran quarterback for a seven-yard loss and the Steelers got the ball back at their 49 with just under a minute remaining in the half. They made the most of it, as O’Donnell completed a 26-yard TD pass to WR Ernie Mills. Pittsburgh took a 17-7 lead into halftime. The teams continued to trade punts in the third quarter until Kansas City went on a 49-yard drive that culminated in a 23-yard Nick Lowery field goal. Now behind by seven entering the fourth quarter, the Chiefs put together another scoring drive. Montana hit on passes of 22 yards to WR Willie Davis and 19 yards to Birden and Allen ran two yards for a touchdown. With Lowery’s extra point, the score was tied at 17-17. The Steelers came right back, however, as O’Donnell got Pittsburgh into Kansas City territory with a 26-yard pass to WR Dwight Stone, and seven plays later he tossed a 22-yard scoring pass to TE Eric Green. The Chiefs went three-and-out in their subsequent possession, but Pittsburgh couldn’t move the ball. In a pivotal play, Kansas City TE Keith Cash blocked Mark Royals’ punt, which WR Fred Jones returned 31 yards to the Steelers’ nine yard line. Montana threw a seven-yard touchdown pass to WR Tim Barnett on a fourth-down play and the score was again tied at 24-24 with 1:43 left on the clock. The Chiefs got another opportunity to win the game in regulation when the Steelers went three-and-out, using up just 29 seconds on three pass plays (one a completion). Following a 50-yard punt by Royals, Montana drove the offense from the Kansas City 28 to the Pittsburgh 25, but Lowery’s 43-yard field goal attempt was wide to the right and the game went into overtime. The Chiefs had the first possession in the sudden death period but had to punt, and the Steelers were able to advance to midfield before having to do likewise. Three passes got Kansas City to midfield, and then Montana completed an 18-yard throw to Cash to the Pittsburgh 32. Six plays later, at just over 11 minutes into overtime, Lowery kicked a 32-yard field goal to give the Chiefs the 27-24 win. Kansas City outgained the Steelers (401 yards to 369) and had the edge in first downs (28 to 21). Neither team suffered a turnover and each was penalized five times. Pittsburgh had a four-to-three advantage in sacks. Joe Montana completed 28 of 43 passes for 276 yards with a touchdown; Dave Krieg’s one pass produced the 23-yard TD. Keith Cash caught 7 passes for 56 yards while J.J. Birden gained 72 yards on 6 receptions that included a touchdown. Marcus Allen (pictured at right) led the Kansas City running attack with 67 yards on 21 carries, scoring once, and also caught four passes for 29 yards. For the Steelers, Neil O’Donnell went to the air 42 times with 23 completions for 286 yards and three TDs. WR Jeff Graham caught 7 passes for 96 yards to lead the club. RB Leroy Thompson gained 60 yards on 25 attempts. “Part of the fun of the game is having to deal with pressure,” said Montana afterward, as one who, in the twilight of his career, had once again delivered a clutch performance in the postseason. Montana and the Chiefs continued their heroics the next week, defeating Houston in the Divisional playoff, but came up short in the AFC Championship game at Buffalo.